When a baby is born the parents want to remember everything. Sadly, as you get to the 2nd, 3rd or subsequent children it gets a little less likely that all of those milestones will be recorded like with the first. I know I could wallpaper my entire house with pictures of my first child, then a couple of rooms with pictures of my second. But the photos of my third child.... well, that's just embarrassing. Sad thing is that my third child was the girl after two boys! But having the three of them in a time line of three years meant there was definitely not much time to spare. My heart always skips a beat when I book a newborn photo session. But how exciting to think I also get to also capture those special milestones as that baby grows up, and what could be better than turning 3-months-old AND going for your first trip to the pool! C was just not so sure when Mommy and Daddy first got him into the pool. He had quite a concerned look at first! He was definitely watching his Mommy to see how he should react! to me it seems rather timeless. 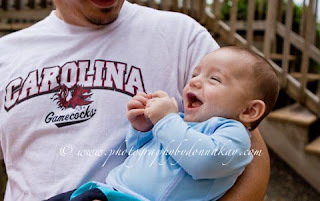 C is one blessed little guy to be loved as much as he is!! Everyone just wants to eat him up when they are around him. This was one of my favorite photos from this shoot in color... but it's also a favorite in b&w. 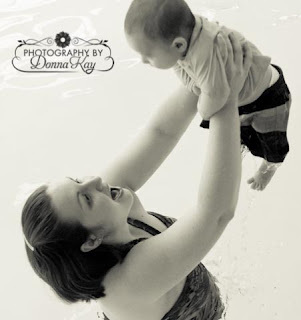 Capturing those special moments is definitely what Photography by DonnaKay is all about. And I hope as time goes by that there will be more and more families who allow me to share in their milestones -- both big and small! Under the Boardwalk...or maybe just a pier!